When I visited Zion National Park in Utah, USA I was inspired by the towering mountains and cliffs of rock, reaching from the canyon floor into the sky. I took many photos of the intersections of the peaks and was intrigued by the meeting point, the line they created. These images were perfect to revisit for this challenge. I see A Way Beyond as a metaphor for Life's journey which is not always smooth. We encounter junctions, dead ends and blockages along the way. If we can keep our focus on what lies beyond, we can overcome the difficulties and find a way through to our future. Materials- hand dyed fabric, printer ready photo sheets, wadding, oil paint sticks, thread, commercial fabric backing. Wow very striking Sue. 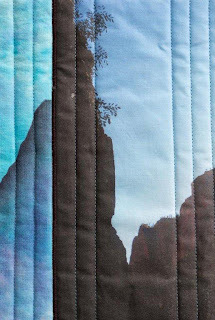 Like the sharp outlines of the mountains and particularly the vertical quilting. Defines the horizions challenge perfectly. I like the verticality....meeting points. Very interesting. AND, now we see how perfect the backing fabric is! I agree, this is very striking. 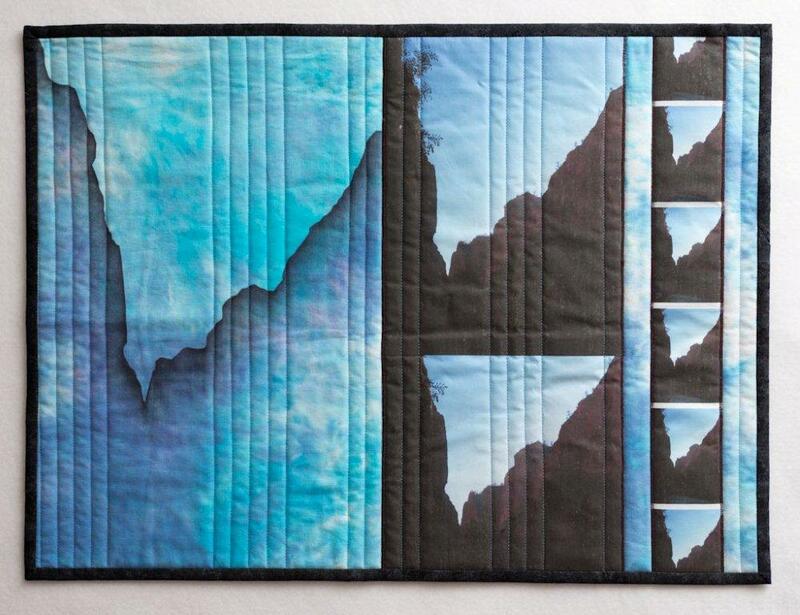 The simple, vertical quilting is the perfect complement to the rugged mountains. Beautiful - the repetition of shapes is very well done; it sets a perfect balance between the larger and smaller ones. I like the way you drew from the positive/negative shapes from the photo and created a more abstract line on the left. It reminds me of the graph lines of a Richter scale, keeping with the idea that life is not always smooth. Very striking! Initially I thought the section on the right was some sort of graph; the line created echos peaks and valleys found in a geographical or chemical or financial table. This seemed to be the mountains as metaphor challenge (I swear I didn't peek). Wonderful piece from the positive/negative, scrubby brush to the small "proof sheet"-like photos. 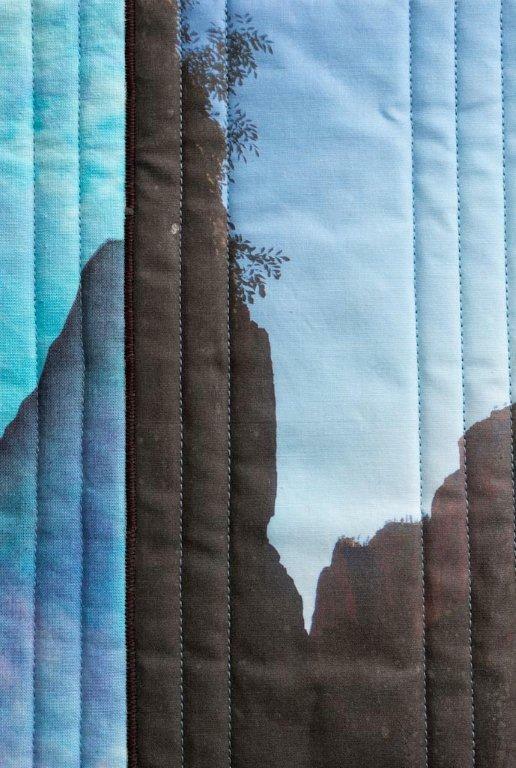 Beautiful piece of fabric! Thanks for all the thoughtful, positive comments. I worked to the KISS 'keep it simple Susan' idea. Photo printing just seemed to be the right technique for me in this challenge.